PIERRE, S.D. - Secretary Ben Jones watched alone from a near-empty gallery Thursday night, as a tired state House of Representatives wouldn't let pass either of the last bills the state Department of Education -- and the governor who hired him to lead it -- had hoped might help South Dakota schools perform a little better. The losses were the finishing blows lawmakers landed against changes sought by Governor Kristi Noem and Jones, a Dakota State University dean who took six months leave to work for her. Legislators blocked all four bills from Noem's administration or fellow lawmakers on civics and citizenship. They also beat two others intended to let schools be flexible on timing of standardized tests. These representatives and senators were the some of same group who in January had applauded the former congresswoman, when she highlighted in her first State of the State speech the need for students to show more knowledge of citizenship. In the eight weeks since, Noem discovered her ideas to spread out testing and teach civics had little or no official support from mainline education groups, whether the school administrators, the school boards or large-enrollment school districts. Their lobbyists listened together Thursday night on the cushioned furniture in the lobby next to the House on the Capitol's third floor. Meanwhile Jones moved one floor up, sitting by himself among empty rows of bare-wood folding seats that ring the chamber's viewing area. The sides had been coming back for days, each wanting to win, no one quite sure why their bills kept getting delayed. The governor and education secretary already lost two of their bills: In the Senate HB 1066, that would have required students pass a citizenship test before they could graduate high school; and in a House committee SB 24 for flexible timing on standardized tests. 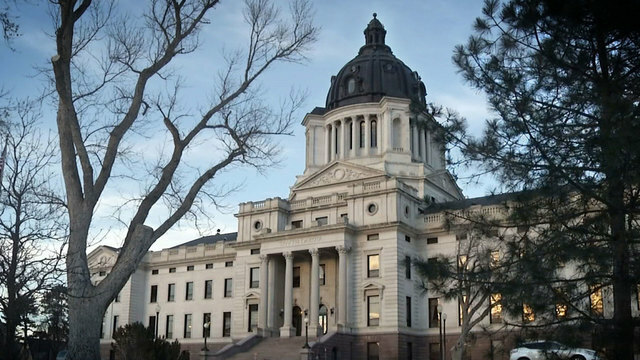 Noem and Jones also saw that the House had refused a bill from Representative Fred Deutsch that would have authorized the department to give a "Good Housekeeping"-like stamp of approval for schools that voluntarily participated in a civics program. And the Senate had tabled a broadly-worded bill, from Senator Jim Bolin, that said only its purpose was to improve civic education but looked like a legislative life-jacket waiting if needed to be turned into something more. So on Thursday night, with the House members deciding they would stay as late as needed to get through all of the bill, the representatives slowlly worked down to the last two. SB 52 called for the department to survey schools about the adequacy of history and civics instruction. Bolin, a Canton Republican, originally introduced it for something more serious. He wanted to require the state Board of Education Standards -- whose members are appointed by the governor -- add a half-unit of civics to the courses necessary for graduating high school. The department supported it the additional half-unit, but Bolin chose to change it to a survey, and the Senate approved 30-0. Deutsch, a Florence Republican who's served on his local school board, realized Thursday night the House was a rockier path, if only because it has 70 members. The point, Deutsch told the 63 representatives still on the floor, was to have each school's leaders rate their local programs. "Where are we showing strengths and where are we showing weaknesses? We test for English, we test for science, we test for mathematics, but we don't test for civics literacy," he said. Representative Taffy Howard rose against it. The Rapid City Republican said there could be a similar result if the Legislative Research Council staff contacted the department to send out the survey, She said passing a state law was unnecessary. "C'mon," Howard said, spreading her arms. "I don't know, it's like -- This is a statute." Representative Caleb Finck said a smoother route would have been a legislative resolution, telling the department to do the survey. "I understand why it's a bill," the Tripp Republican said, "because this was obviously drafted past the time when they can introduce a concurrent resolution. I understand that. But still, I'll be voting no." "Guess what? They don't have to respond to that. They don't have to provide the information if they don't want to," Otten said. Deutsch explained what led to the request for law requiring the survey. "The impetus to do this was deficiences that the Department of Education felt were in their records. They thought it was a worthy project to do, that it would provide us the data necessary to make changes or not make changes," Deutsch said. He continued, "It's hard to push into a new realm without the data. We all got excited as a body about helping our students better learn civics." The scoreboard showed the result: 30 yes, 33 no. Deutsch pulled out his cell phone to take a photo of the green and red names that added up to defeat. Last came SB 188 that would have given more flexibility to when schools conduct standardized testing. The Noem administration and some legislators wanted schools to be able to split apart tests and give pieces of exams at the ends of courses, when recent material would easierfor students to recall.. Instead schools will have to continue to follow the state law that took effect for the 1998-1999 school year. The most recent version requires standardized assessments in grades three through eight and grade 11. That three-year gap corresponds with a drop in average test scores. Even so, SB 188 failed, by a lot: 18 representatives pushed green buttons at their desks to support it, while 45 went red against . Howard had stood again as an opponent. She was interested in how much knowledge students retained during those three years where standardized tests aren't administered. "I've said this many times on the floor. Our kids are hovering around fiftieth percentile for proficiency ratings for math and grammar. They are not doing well, and I see this as a way of possibly raising the testing scores, but we're going to be hurting the kids," Howard said. She continued, "We need to be raising our standards. We need more math, more science, more grammar, and you all know they changed the standards recently so there's less math required. I think we're going the wrong direction." Another to speak against was Representative Ray Ring, a Vermillion Democrat who is a retired University of South Dakota professor. Ring said he was willing to trust teachers. Represenative Lana Greenfield, a Doland Republican who is a retired teacher, chairs the House Education Committee that worked on the bill. She wanted it passed. "It doesn't really matter at this point in time how you feel abou this, because the bill is not about whether we're going to give a test or not. The bill is about asking us for our approval on this test. An ace is held with the Department of Education and they will give the test, no matter what," Greenfield said.